Within the Rainbow of all creation we are one. The Rainbow is the circle the sacred shape of harmony. All things are a circle, each thought, word, and action creates the circle. We live on the Mother Earth that is the shape of a circle. Grand Father Sun and Grand Mother Moon all held in the circle of Father sky. The within, the within, the within. In the center of all this Creation is Mother Earth. Unconditional love is granted to all things that live here on the Mother Earth. We are clothed and nourished, sheltered and given warmth here on this Earth Mother. There is no discrimination as to race, color, political or religious beliefs. We are all one with the Earth. If one person or thing is in danger then we are all in danger. When one person is hungry, we are all hungry. When a race of people are persecuted and denied freedom, we are all involved. The web of life that connects all things is also connected to each of us. When the web is whole and strong, so is the life force of all things. When the web is weak, and lacking in support, the quality of life is weak. Let us all take up the strand of the web that we have been given to hold. Together let us weave a better world for the children to come. To live in harmony the circle must be strong and good. There can be no place where truth is not spoken. Light is needed to create life and when truth is spoken there is light. We gather here in this Sacred place of giving. 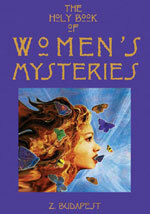 We place words on a piece of paper; let us live those words we write and find the truth within all things. May Peace be whispered so softly by all living things, that it will be a great voice, heard around the world. Listen for it in the wind, hear it in the trees, feel it in your heart. Truth is the source of living, Love is the place of giving, Peace is the product of forgiving. Written and placed in the Peace Scroll for the year 2000. Dedicated to learning and healing. I pass the Talking Stick to you. 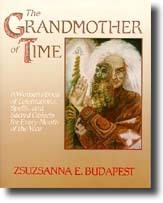 In The Grandmother of Time, Zsuzsanna Budapest teaches both beginners and experienced practioners how to intergrate wiccan spirtuality into their everyday lives. Here are new approaches to today's rituals, from birthdays and dedications of newborn babies to purifying our homes and protecting us in travel.